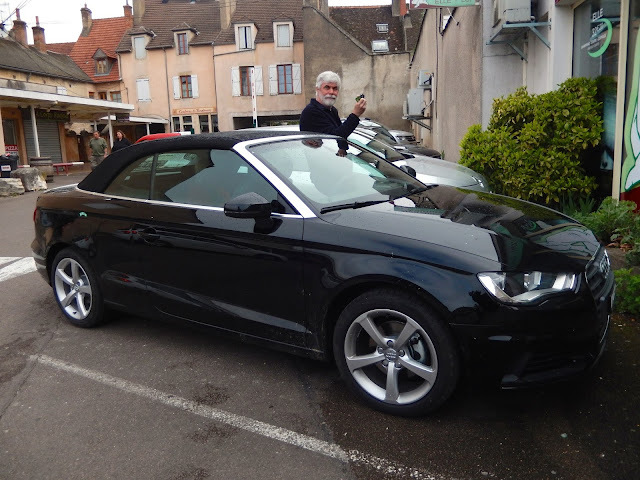 As I mentioned in my last blog entry, Bob and I rented a car the weekend my sister and her husband visited us and drove to the Burgundy region of France in tandem with three of my colleagues, Jen, Terry and Dan. We had spent some time in this region some seven years ago, and were eager to return. We were given an upgrade: an Audi Cabriolet - but we never let the top down. Too cold and wet. 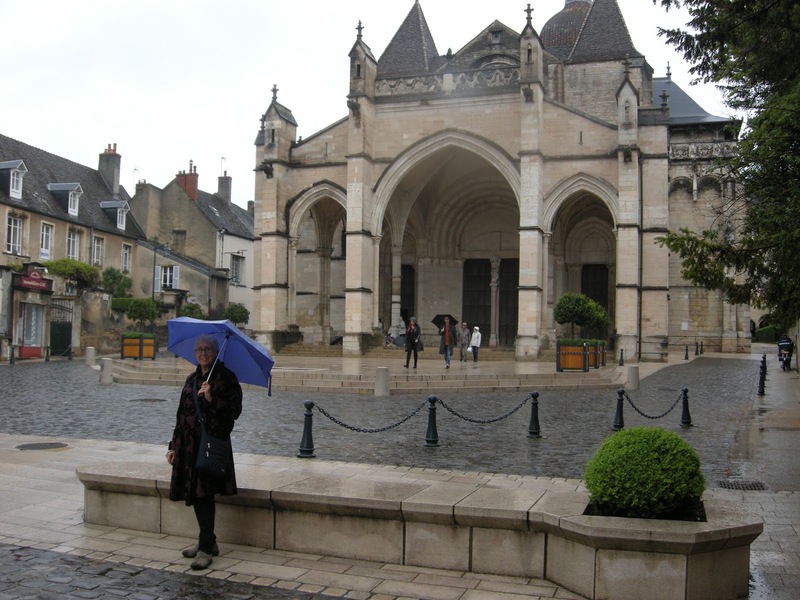 The forecast had been for rain and that is what we got when we arrived in Beaune at about 11:00 a.m. on a Saturday. It was market day, so, as we always do when we cross the border, we all bought some groceries (French prices are much more reasonable than Swiss ones.) We headed off in different directions, with a plan to meet again in about an hour. 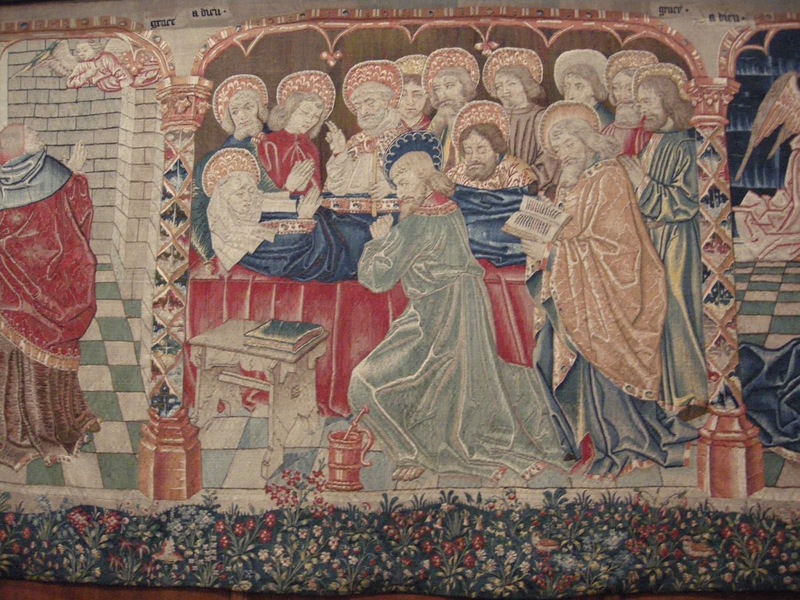 During that time, Bob and I decided to slip into the Romanesque Basilique de Notre-Dame nearby. It has an unusual façade, but the highlights of this church were the 15th century tapestries on display in the choir area. When we drove through this town in 2008, Bob and I had noticed the roof of the Hotel Dieu but we had not visited the site then. This time, after lunch, we made a point to do so (as did Jen). 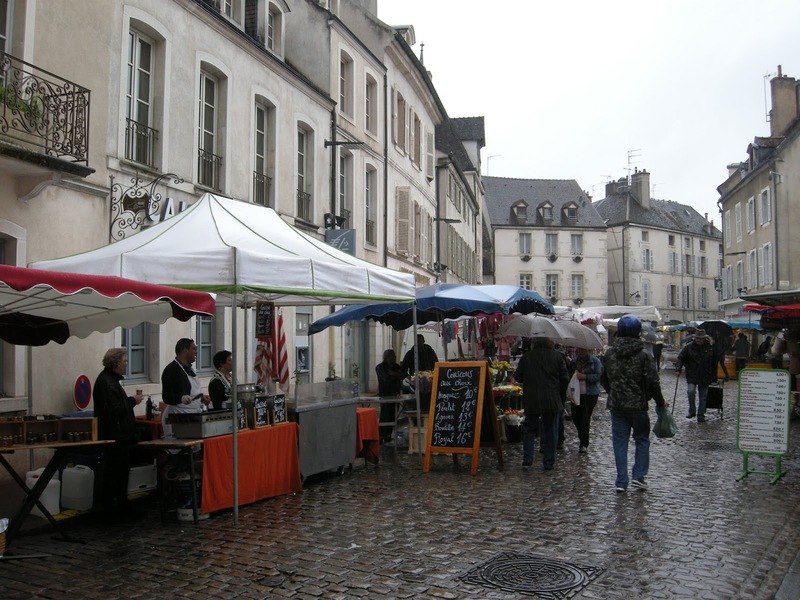 The complex of buildings, located very near the market area, has a long history. Known also as the Hospices de Beaune, it was created in 1443 as an charitable almshouse, and remained a hospital until the 1970's. 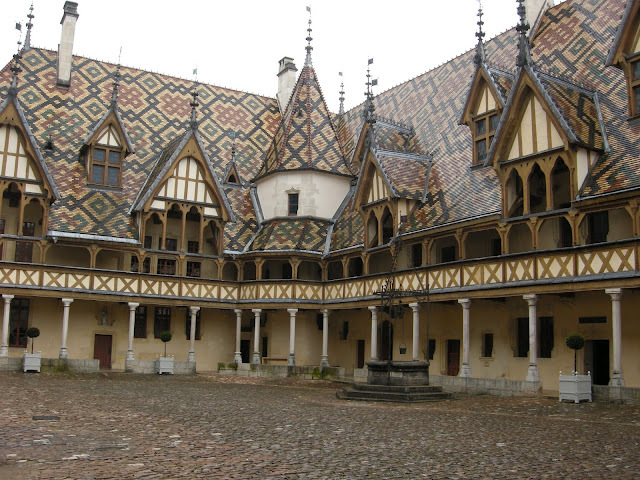 The architecture of the place is remarkable for the typical Burgundian tiles on the roof, the dormer windows and the large "Room of the Poor, where the bedridden were housed. 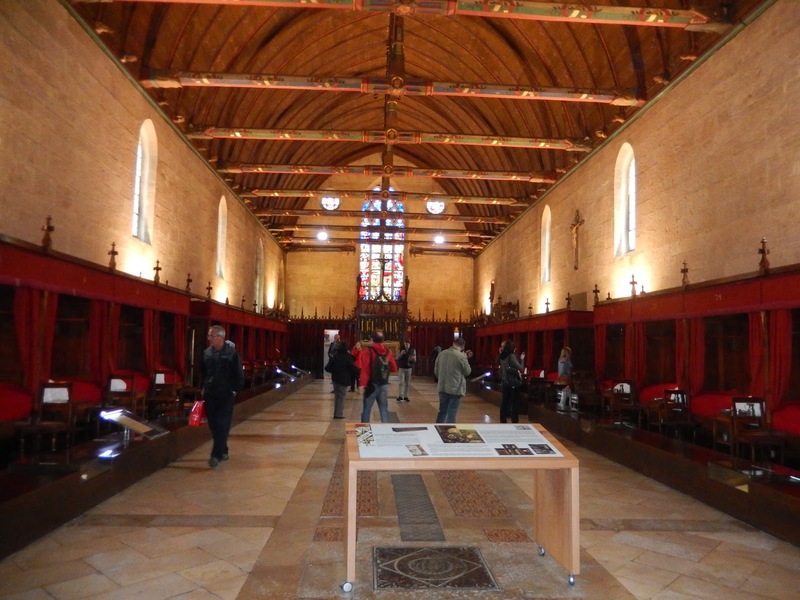 At one end of this chamber is a chapel so that the very ill could still attend Mass. Canopied beds line the Room of the Poor. 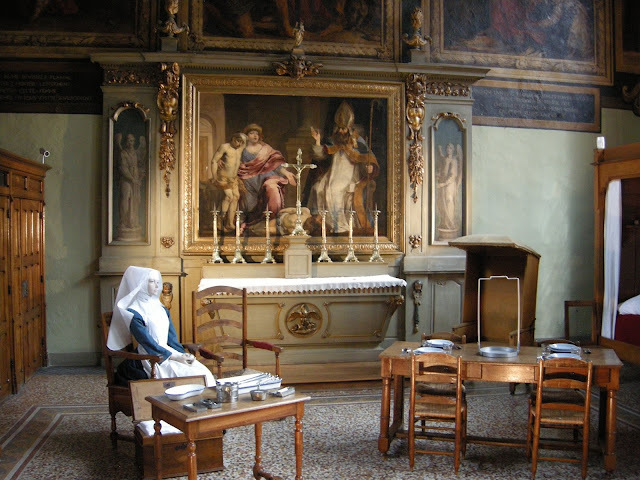 There are other impressive features of this museum which documents the lives of the order of nuns who worked there as nurses, and the various medicines that were administered to the sick, as well as religious artifacts like a magnificent altarpiece. It was well worth a visit. There are still nuns here but they they are not real. I documented most of the rest of our day in Beaune in the last blog post with the exception of a lovely walk we took that evening to work off a fraction of our delicious dinner. By then the rain had stopped and Beaune was lit up. It is a very pleasant place at night. 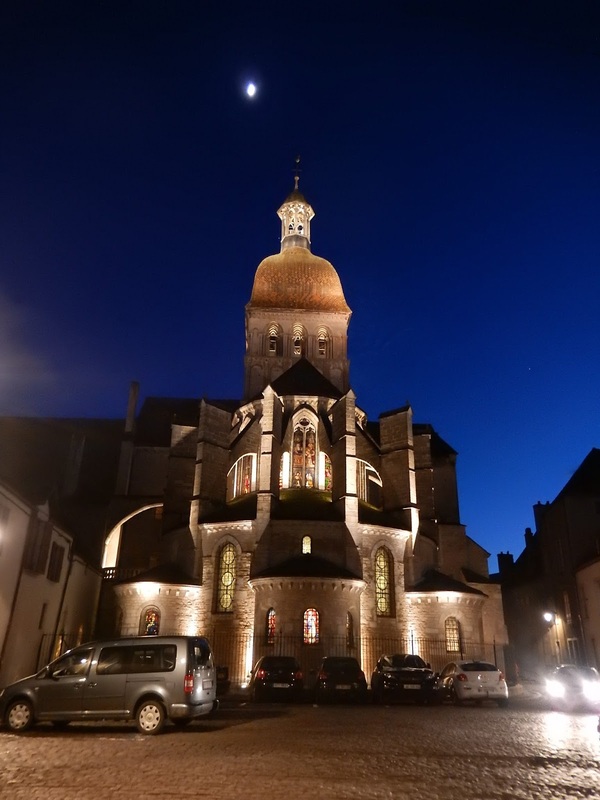 The rear of the Basilique de Notre-Dame at night. 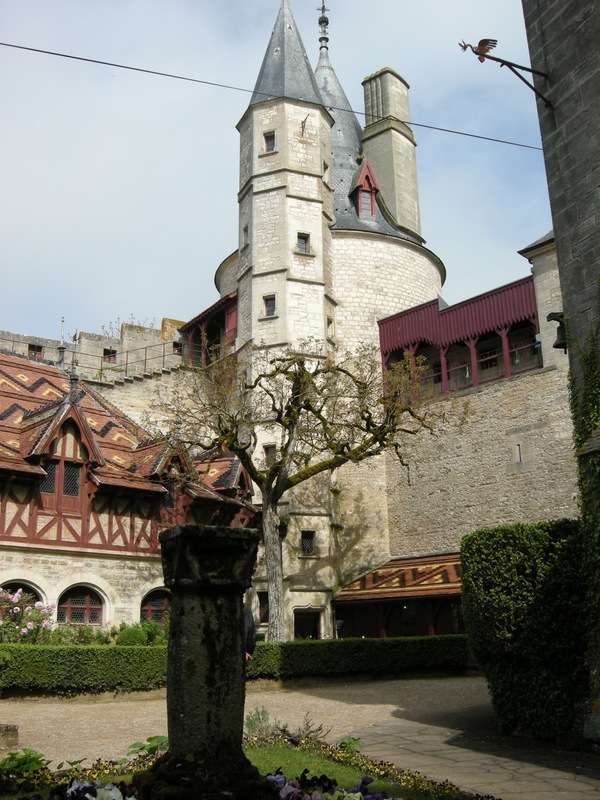 The next morning, at Dan's suggestion, we all drove to a castle nearby, the Château de Rochepot. Pauline, Ron, Bob and I opted to pay extra for a tour, while the others explored the grounds only. Photography was not permitted inside, so I have no pictures of the rooms on the tour; from our guide, we learned a lot about the efforts of the Carnot family to lovingly restore a near ruin to its former glory. 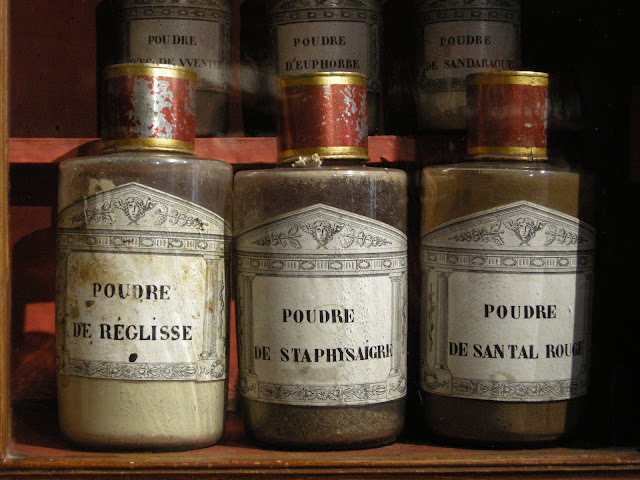 This task was undertaken in the late 19th and early 20th centuries, so that the building is now a living museum of that era as well. The kitchen is particularly impressive, I recall. 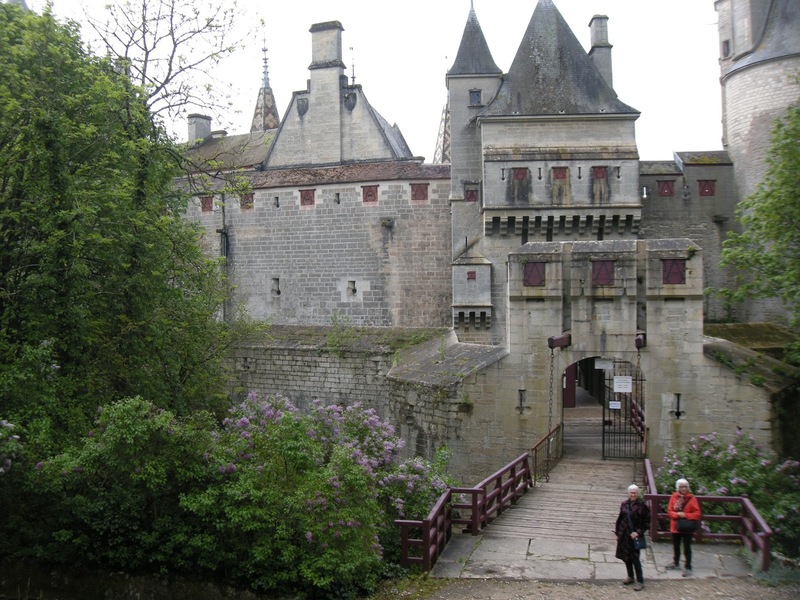 The drawbridge at the entrance to the Château de Rochepot. The grounds are lovely, too. We all climbed to the top of the tower where we could see a small village in the distance. 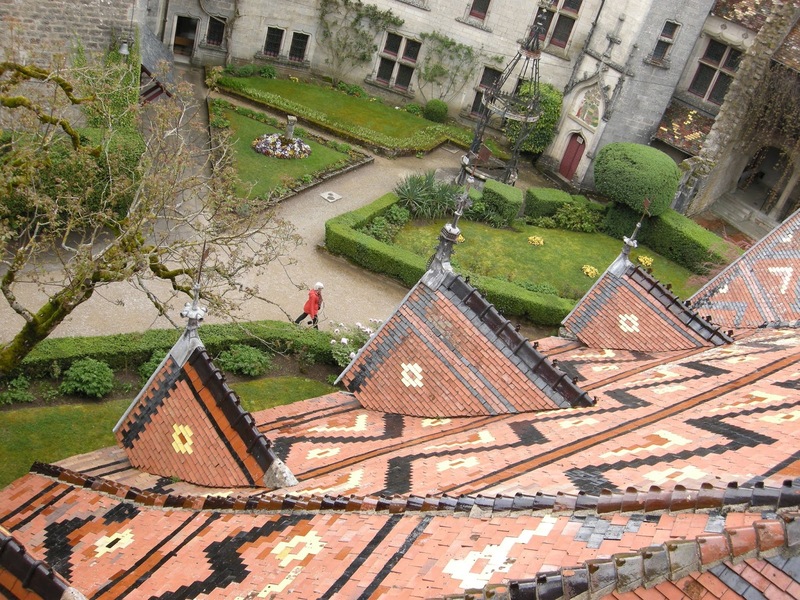 Like the Hotel-Dieu in Beaune, the roof of the château is tiled Burgundian style, as is most evident in the photo below. The view to the courtyard from the tower. 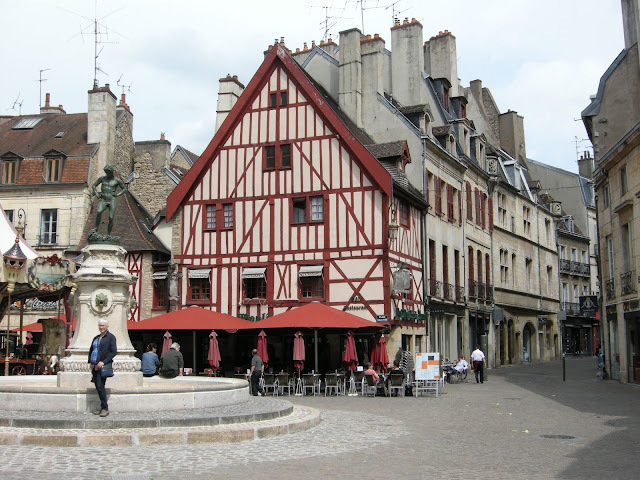 Our final destination of this whirlwind visit to Burgundy was its capital, Dijon. Bob and I had explored this lovely city in 2008, and we were eager to see it again. We arrived at lunch time on a Sunday, a very quiet time. The old city centre seemed nearly abandoned. 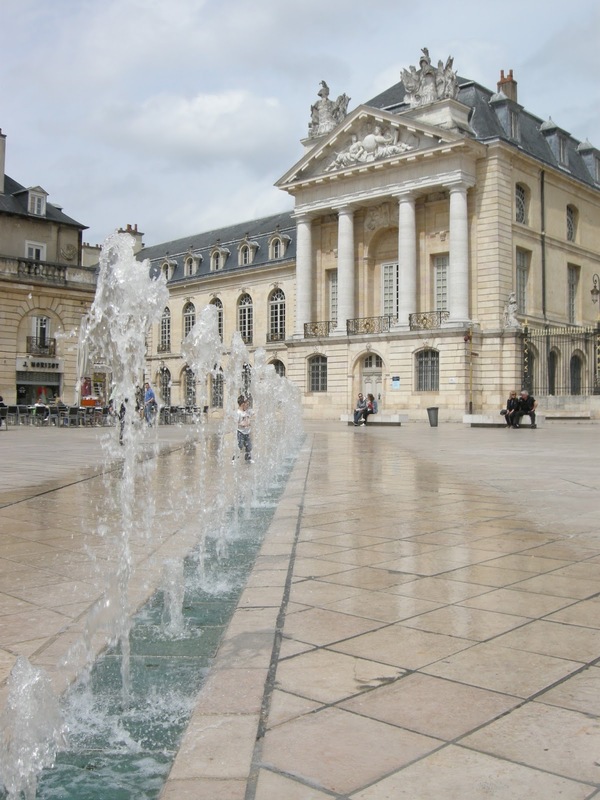 The fountain at la Place de la Revolution with the Palaces in behind. We could only stay an hour or two, but in that time, we saw many of the highlights. The Palaces and Estates of the Dukes of Burgundy which dominate La Place de la Revolution are monuments to the great importance of this city in its heyday, from the 11th to the 15th century, although the buildings which dominate the square were erected in the 17th and 18th centuries.. 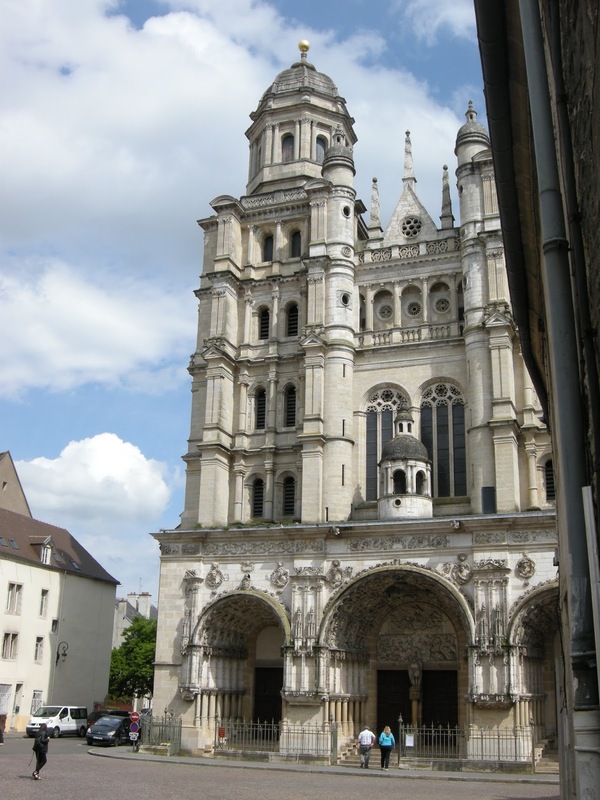 There are also two notable churches in the old part of the city, both of which are interesting monuments: the cathedral of Notre-Dame and l'Eglise Saint-Michel. 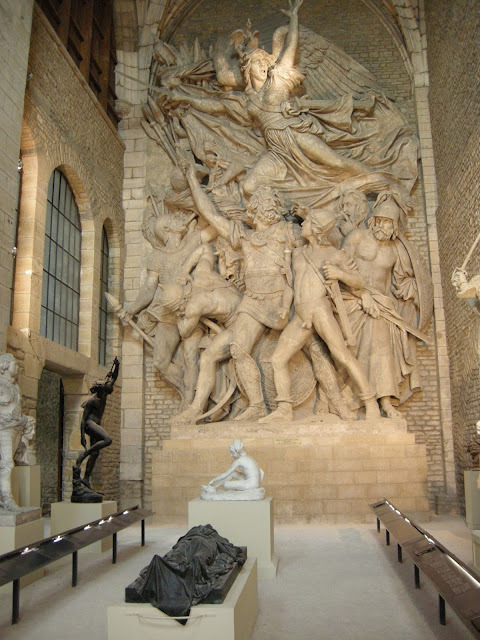 Nearby, in the François Rude gallery, we were very impressed by the large sculpture created by the man whose works adorn the Arc de Triomphe in Paris. He is a Dijon native. Also native to the city, is its eponymous mustard. We all bought some of this condiment which now comes in many varieties. The main square in Dijon. The mustard store was on the right, just out of the picture. In all, we spent too little time in Dijon and in Burgundy, but I have since discovered that I can get there by train in just over two hours, so a return visit is in my plans.